LifeLine Repairs is a recognized innovator in electronic repair services throughout the Southeast. Their reputation has been built on excellent customer service, high-quality products, effective services and innovative solutions. LifeLine is committed to creating a truly “life-saving” experience in which customers are able to get their devices up and running again in a very short period of time. We were excited when Roberto Marquez, owner of LifeLine in Boca Raton contacted us and inquired about vehicle wraps. He was developing his first store in the region and wanted to start advertising ASAP. 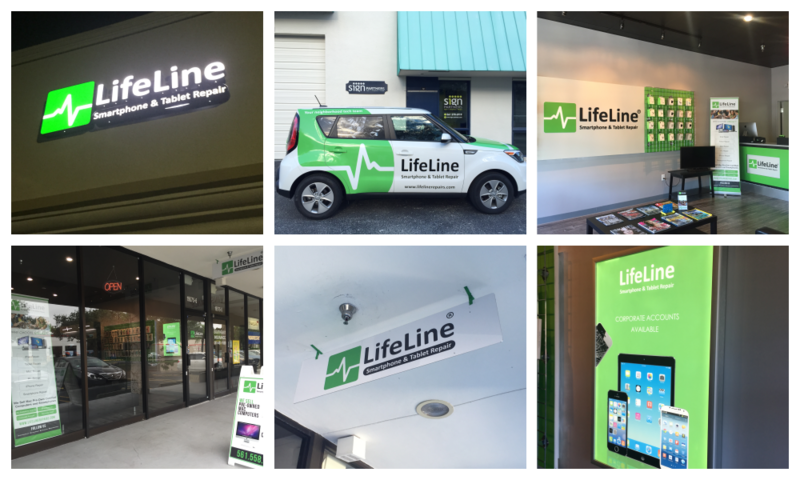 Our partnership developed further and we designed, fabricated and installed a series of signs for LifeLine, including outside illuminated sign, window graphics, trade show items and store signs. Roberto was opening his new business and it was fundamental to understand his perspective. DEADLINES | We had to be assertive and project manage throughout the entire process - everything had to be ready on time for Grand Opening! GET NOTICED | Effective designs were key! We had to communicate his message clearly so his name and brand could be heard and understood. QUALITY | LifeLine provides high-end service to customers, their visual communication must be in-line with their identity.